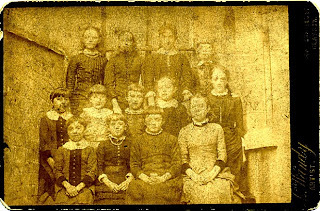 This is a first for the Antique Dog Photograph Gallery - a school group photo. Look carefully to spot the dog in the middle of the front row. Click on the image to enlarge for a better view. The photograph was taken by L. Wandy of 108 Renfield St, Glasgow, Scotland. Wandy is somewhat of a mystery, as there is no trace of him to be found in trade directories of the time, or in any variation of a search on ancestry.com that I have been able to think of. 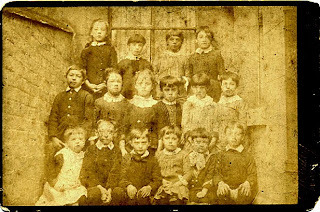 However I have found other examples of school photos by Wandy, so they must have been something of a specialty of his. The style of the mount dates the image to the mid-1880s. The address in Renfield Street was occupied by J. Douglas and Son photographers until 1883, and subsequently David Duiguid & Son photographers from 1885 till 1886. So perhaps Wandy worked for one of these firms as a guest, and this would go some way to explaining the title of "Artist" rather than photographer on the photo mount. 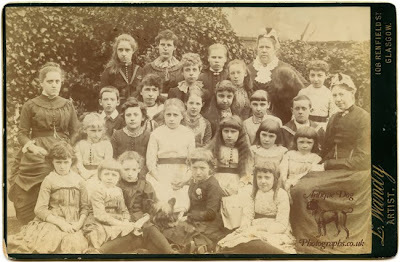 On the reverse of the photo "Mrs Thorpe's School" is written faintly in pencil. I wonder if the woman on the far right of the back row is Mrs Thorpe? 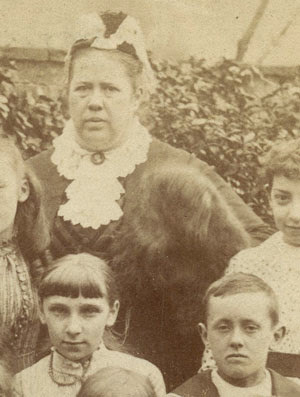 This woman, who ever she is is holding something hair under her arm, which must be a dog, who was perhaps unable to keep still when the photograph was taken. The main attraction of this photo is the little dog in the centre of the front row of children - a Clydesdale or Paisley Terrier. 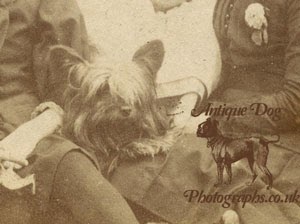 It has been said that this terrier was originally a cross between the ordinary Skye Terrier and the Yorkshire terrier, but, although it is of quite modern origin, no proof has been produced when such crosses took place or who made them. Much more likely origin is that the variety was made by the Glasgow and other Scottish dog fanciers crossing the softer-coated, lighter-coloured prick-eared Skye terriers with each other until they bred fairly truly and produced the Skye terriers in an altered form. At the shows which used to be held at Glasgow... these silky-coated terriers were seen in all their beauty, and the fact of their appearing there as Skyes was what first brought them into prominence. 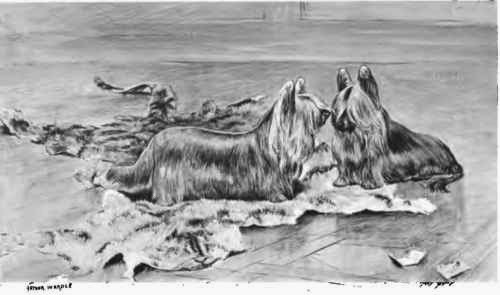 The fanciers of the hard-coated Skyes rose in arms against them, holding that they were not Skyes, as they had a silky coat, and were only pretty 'mongrels' bred from Skye terrier 'rejections,' and ought to be known as Glasgow or Paisley Skyes. On the other hand, the breeders of the silky-coated dogs held, as a matter of course, that the texture of coat their dogs possessed was the correct one. This was untenable, as until the introduction of this breed no Scottish dog had a silky or soft coat. After the decision against the eligibility of the silky-coated dog to compete in the Skye terrier classes, the breed rapidly declined. A few, however, held to the breed out of pure love and admiration for it, but they were few. awww so cute, looks alot like the Yorkies and the Australian Silky terriers. It's a pity that this breed is now extinct, I'm wondering if it can be reintroduced again. I love toy terriers.